Do you have trouble parting from your most trusted companion? Do you take your dog on long hikes or on other land-based adventures? Are you wondering if you can go kayaking with a dog, too? 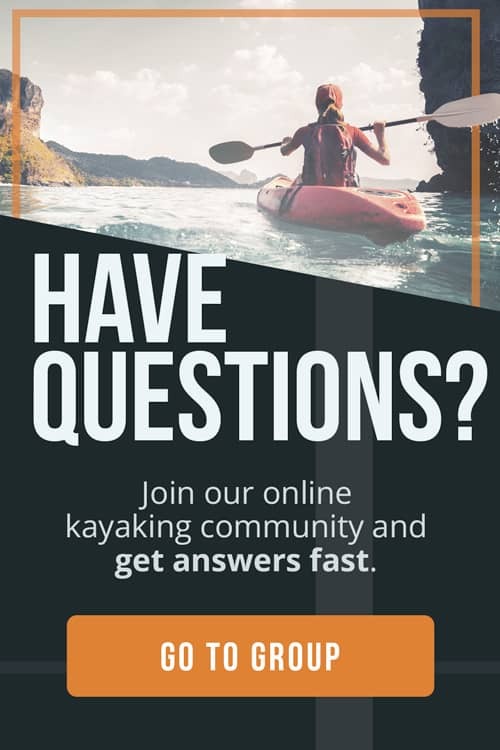 If you’ve answered “yes” to any of these questions and you’re planning a kayaking trip, you’ll be pleased to hear that you can, in fact, go kayaking with a dog. And you’ve come to the right place. Here at The Adventure Junkies, we’re dedicated to offering our readers practical tips and useful advice about all things outdoors. This includes kayaking. 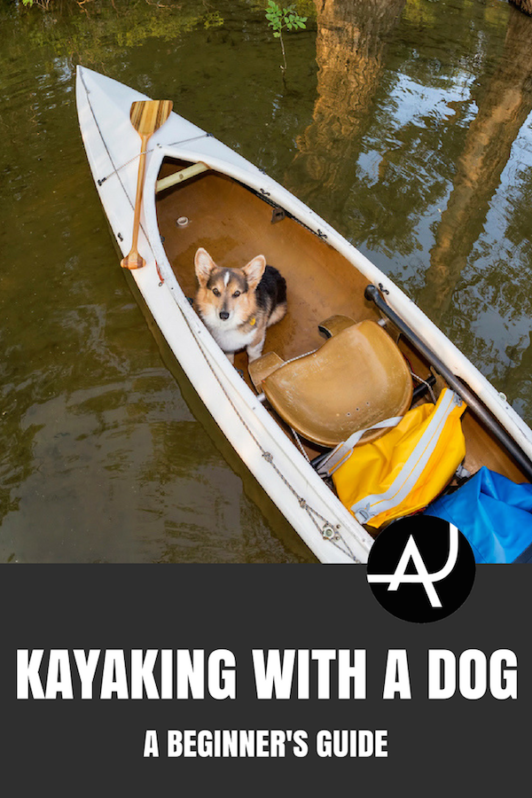 In this article, we’ll talk about the things you should take into account if you’d like to take your dog with you on your next kayaking excursion. 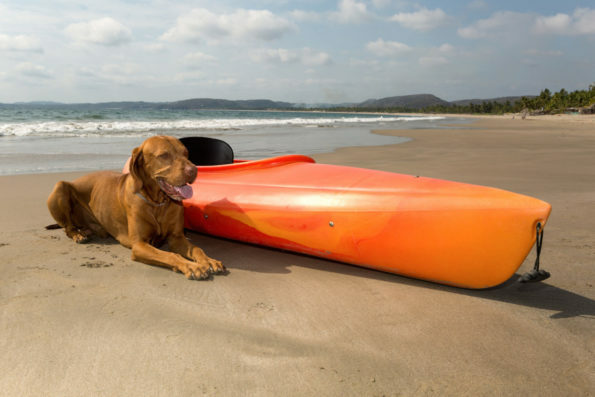 Yes, it may seem like an exciting idea to be able to take your canine friend with you on a kayaking trip, but there are a handful of things you should take into account. There’s some serious potential here, says Active.com. Giving yourself a back, arms and core workout while allowing your dog to get out and go swimming is fantastic. You can’t get around it—there are dogs that simply do not have the personality or temperament to be confined to the space of a kayak. Some dogs don’t appreciate water at all. So, really, do think about your dog as well. Don’t think only about yourself and the great potential that kayaking with a dog has. No one wants to be stuck on a kayak with a dog that absolutely hates it. If your dog has a nervous character, doesn’t like being around water or is hyperactive, you’re best off leaving it at home. If you’re lucky and have a dog with an exploratory mind, you still shouldn’t just take it with you on a whim. Kayaking will be something entirely new for any dog. Therefore, it’s important to let your dog get used to being around—and in—a kayak. Kayakcritic.net says that, because of their size, kayaks can be scary to a dog. And they’re right, of course. Chances are your dog has never seen a kayak before. So, don’t just put it in it and expect it to immediately love everything. It’s important to allow your dog to get to know your kayak on its own terms and in its own time. 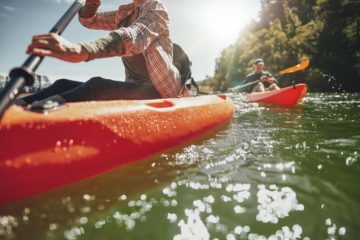 You can speed up this process by always having your kayak around. Put it into your living room and bring it out in the garden whenever your dog is outside. Eventually, once you’ve seen it sniffing it out and getting used to it, you can try and place your dog in your kayak. If that’s a bit too rash, go sit in it yourself and invite your dog to join you. To make it more comfortable and familiar, allowing your dog to bring its favorite blanket or toy might help. Using treats as a reward offers some extra motivation. Don’t go overboard with them, though, because you don’t want to associate your kayak with constant treats. You’ll be feeding it all the time when you’re actually out kayaking! The section above already touched on training your dog. 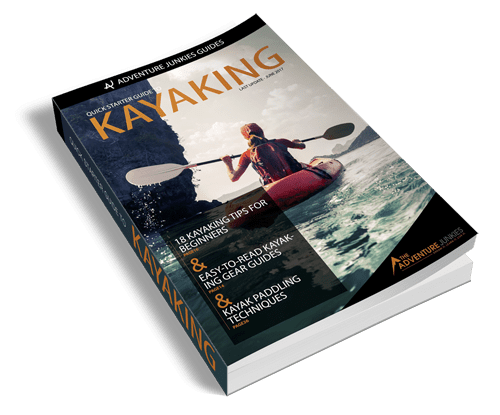 The first step is to familiarize your dog with your kayak. It just makes sense to let your pet get used to the boat before you get into the water. Continue by teaching him to hop into your kayak. Once it’s mastered that, make it sit immediately after hopping into the kayak. Again, you can use special treats to help you (and your dog). Similarly, also teach your dog to jump out of your kayak and sit down and wait for you. These loading and unloading steps are critical. Be patient, respectful and—perhaps most important—consistent in your training. Once your dog is used to hopping in and out of your kayak and being in it, you can move to shallow water. If your dog realizes that a kayak is a stable environment to be, even if it’s generally not a fan of water, it might end up really enjoying going kayaking. Take your kayak out into a shallow lake or pond nearby and see how your dog responds. Once it’s in your kayak, definitely make sure to offer it a treat the first time. Tell it to sit (if it doesn’t do that automatically already). Your dog should learn that it needs to sit down and remain still when on the kayak. Make sure your pet is trained well and knows all basic commands before going kayaking with a dog. Every dog should know the three basic commands: sit, down and stay. Taking a dog that’s not familiar with these on a kayaking trip is asking for trouble. There will be no way to train it beforehand anyway if it doesn’t listen. This is why commands are essential. “Sit” and “stay” are important commands when in the kayak. It’s also a solid idea to expand your range of commands beyond those simple ones. 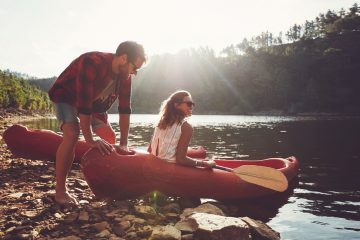 You can come up with a command for getting into the kayak—for example, “up”—and for getting out—“out”. Be creative. You’ll also notice what areas you need to work on after your first couple of kayaking outings with your dog. The number one piece of gear you’ll need for kayaking with a dog is a dog life vest. This is a no-brainer. Even though all dogs can swim, that doesn’t mean they can’t drown. Get a life vest! Getting your dog to wear one might require some extra on-land training before you head out onto a lake or river. Also, don’t forget your dog’s leash. 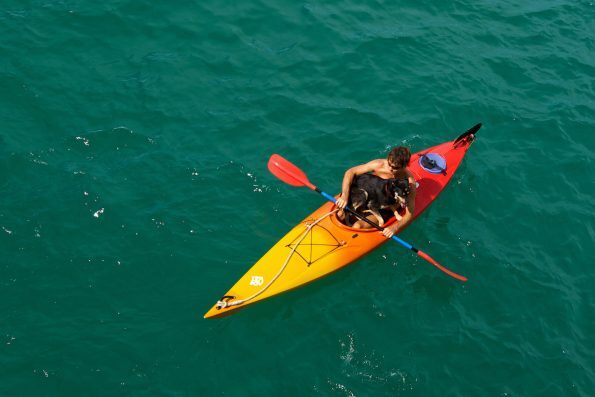 You can keep it inside or on top of your kayak for when you get on shore. It’s a good idea to keep an extra leash in your backpack in case you lose the other one. You might even consider keeping your dog leashed when on the kayak. If you decide to do that, it’s best to put a harness on instead of a collar. If your dog falls into the water, it’ll be easier to pull it back by its harness. If you’re going kayaking in summer, bring sunscreen. It protects your own skin and your dog’s as well. Its nose and belly are prone to burning. Lastly, don’t forget about how fun kayaking with a dog can be! Bring some of its favorite toys with you. A dog is much more likely to behave well on the kayak if it knows there will be playtime once you get back on land.